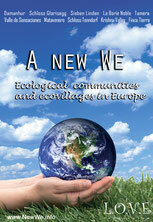 Our team is excited to announce the launch of 'A New We 2012' - an initiative to advocate, promote, and advance new EcoVillage and sustainable community model globally! Launching the new 'Global EcoVillage & Sustainable Community Network'. In partnership with our new publisher, SeThInk Media, donating 10% of proceeds to the Green Fire Foundation to fund EcoVillage development. Partnering with initiatives, organizations, and businesses to strategically plan and coordinate projects/programs geared towards building EcoVillages & Sustainable Communities. Creating a vibrant online community that can serve as a place to learn, share, explore, and build EcoVillages globally. 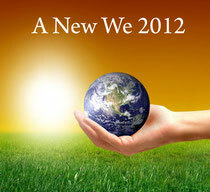 Join us for the launch of 'A New We 2012' on November 11, 2011! I am delighted to hear about this! Looking forward to learning more about building vibrant, compassionate, and sustainable communities here on planet Earth -- thanks! I would love to live/work in or build a sustainable community. And particularly one where naturism is perfectly accepted. Looking for it in the south of Europe. Hi Beiyin! Once you have a clear vision, then establish a well organized connection where other people can reach you is important. In your case i would suggest that a more professional website for FalCon Blanco would be a great help for you. Allowing visitors and volunteers to participate your community life is also important for interacting with outer world. we would like to invite you to join our network,http://www.globalecovillages.org , where you would find many supports and things to learn and share! best wishes for you and your community! I tried to order the DVD, but there was no option for my country South Africa. I sent an query, but no response. I'd like to order the DVD, but I'm wondering if it is closed captioned or has English subtitles for my hard-of-hearing wife. Please let me know. Thanks! Hi Matthew! I'm very sorry that there's no English subtitles, there's only Spanish and Chinese subtitles, and at the beginning of every community, there is written detailed introductions. That's great, we are also going to start up in 2012 in mainland China. I am from Lithuania and very interested in your movie. After watching short introduction I realized, that it is quite difficult to understand some parts. I was wondering, maybe you already have English subtitles. So, would it be possible to watch movie with subtitles, or maybe you have a text in English? Looking forward for your response.